When ever I go to the doctor, I get inspired to go home and cook. I went to the doctor the other day for a hamstring tear and while I was waiting for the doctor, I picked up a magazine to read. I discovered a great recipe for ravioli in brown butter that just sounded delicious. The original recipe had zucchini added to it but since my husband dislikes zucchini, I omitted that ingredient and added mushrooms. Most people like their ravioli with a tomato sauce but not me I prefer it with cheese or this new brown butter sauce. I know the balsamic vinegar in sounds weird but trust me it added a great flavor to the ravioli. So tell me, do you feel like cooking after going to the doctor? Cook ravioli according to package instructions and drain and place in bowl, set aside. cooked remove from heat and pour this sauce over the cooked ravioli. Stir gently to combine. Serve with shredded cheese. Whenever *I* go to the doctor, I get inspired to eat take out >.> But that ravioli looks delicious! That looks oh so good! I really love anything mushroom related so when you add some kind of pasta or ravioli type of food into the mix, I am all in! Definitely going to try it out. 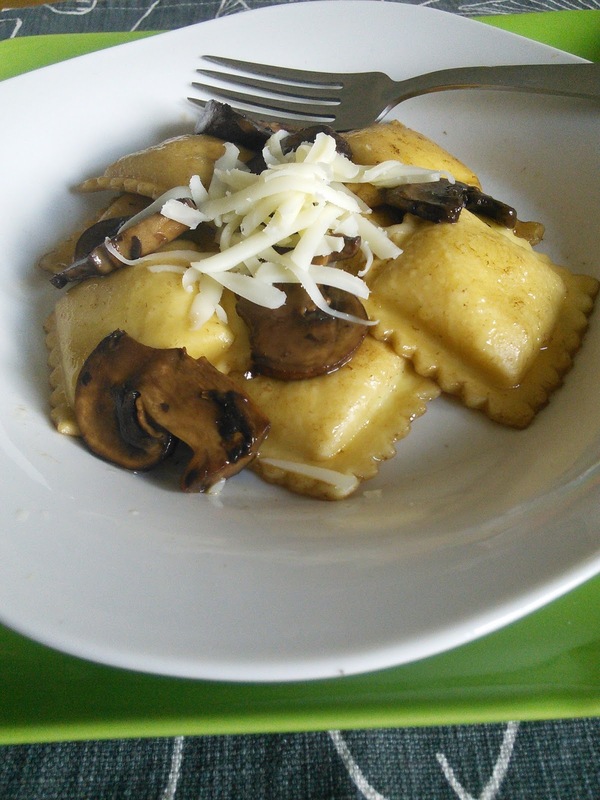 I LOVE ravioli and mushrooms. Whenever we go out to eat Italian, mushroom or lobster ravioli are my go to dish to order first off the menu. Haven't tried to make it at home, but will give it a try. Thanks for sharing your recipe. I'm trying not to eat as much red sauce so this would be something I'd love to try. It looks so good and sounds tasty! I like to just pick up food if it's me going to the doctor but like to make a meal if it's for my kids going to the doctor. This looks delicious! <3 I haven't had ravioli in ages! We love using mushrooms and Balsamic Vinegar in one of our pasta dishes as well. We use Penne pasta though, so I'm going to change things up next time and use Ravioli instead. Thanks for the inspiration.